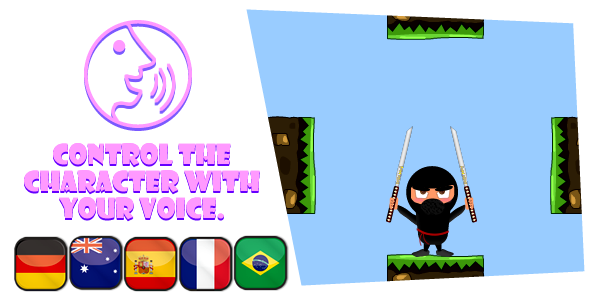 Dark Ninja - Adventure - (C2, C3, HTML5) Game. This is not an ordinary ninja, in fact, this is a skillful collector of stars and the main goal of this ninja is to collect all the stars that are scattered in the scenario being invisible. Your job is to take on the role of the ninja, start the adventure and as soon as you get all the stars, you will open the portal, and only need to enter the portal that will appear so you can finish the level. You need to be cautious and not fly off the screen. You are limited in time and the game has no scores, only portal opening when collecting all the stars, so start liking this puzzle! (✓) – Keyboard or Touch. (✓) – Voice Control – (Disabled). (✓) – Saves high scores. (star levels).